Buy ONLY AS MUCH PRODUCT AS YOU EXPECT TO USE. I find it better to buy 2 quarts or 3 pints of product rather than a gallon can. If I think I'm going to use a gallon - total, eventually - I may buy 4 quarts of product. It's easier to buy more product than risk losing unused product. Wire brush or blast the item to be painted with POR-15. While this technically isn't necessary, I find things look nicer when they're cleaned up before the POR-15 is painted. Clean the area with POR Marine Clean - part # YJ9. Then paint the area with your choice of POR-15 coatings. POR-15 paint is UV sensitive and will fade over time if sunlight can get to it. 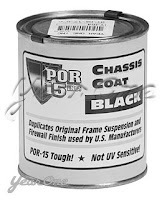 To topcoat your work, use either POR-15 Blackcoat or Chassiscoat black paint. I USE CHEAP DISPOSABLE BRUSHES. I also wear latex gloves when applying POR-15. 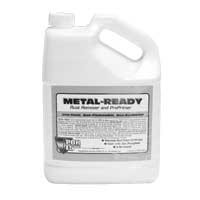 I transfer ONLY AS MUCH PRODUCT I expect to use into a disposable container (plastic bowl, rattle can paint cap, bottom cut off of a 2 liter bottle. and brush the stuff on. POR-15 will lay flat even if brushed on. When I'm done, I throw away the brush, whatever's left over in the container I was working on and my gloves. There you have it. Using POR-15 is easy and is very effect way to kill rust in its tracks. Find more POR-15 products here.